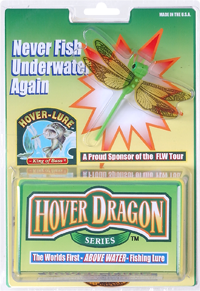 The HoverDragon kit is HOVER-LUREs sample package. Designed for anyone who has never seen or used a HOVER-LURE fishing system but wants an exciting new bass fishing experience. Each HoverDragon kit is supplied with a random selection of colored eyes, wings and dragonfly bodies and creates 2 types of dragonfly. 1 Hover-Lure™ Lily-Pads made from High Quality Polypropylene (Green or Brown, no choice).